Thank you Boots Hetherington for sponsoring the PA Ag Republican KY Derby Event as a Starting Line Sponsor. Tomorrow’s the day! The Run for the Roses!!!! 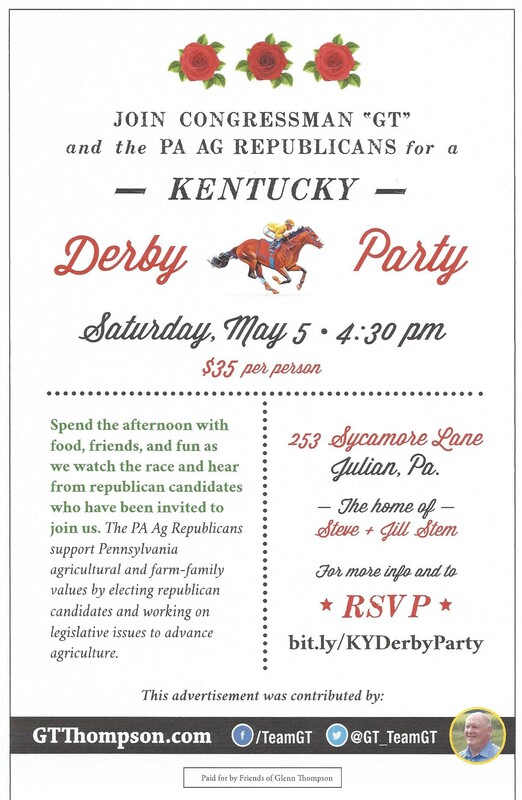 Join the PA Ag Republicans for a KY Derby Party. Walk-ins welcome. It’s not to late to make your reservation for the KY Derby Party! If you have not made your reservation for the PA Ag Republican’s KY Derby Party and would like to attend, please call 570-850-5975. See you Saturday! What to wear to the KY Derby Party? Donnie Millabrand will be entertaining at the PA Ag Republican KY Derby Party on Saturday, May 5th, 2018. He will be releasing a new song at this event. Did you make your reservations? Join Congressman GT Thompson at the KY Derby Party on May 5th. Did you RSVP? What song will you hear on May 5th? Join the PA Ag Republicans for a KY Derby Party on May 5th, 2018. Lots of fun and friends.